Travelling between offices in Stamford, New York, Philly and Baltimore is part of my job. The travel gets old. I’ve been doing it for a very long time. I used to travel every few weeks internationally, so it’s an improvement of sorts that I mostly travel on the Amtrak Acela now — up and down the East Coast. The bonus of travelling is the people. I get to work with, and interact with a great group of people from all different locations. Their backgrounds are diverse, their experiences are fascinating….and their friendship mean the world to me. This week, I travelled down to Baltimore on Wednesday, for what was to be an ordinary work day, full of meetings, and projects, and yada yada yada. After arriving, settling in, getting my second cup of coffee (the first one was in the car — a prerequisite to driving myself to the train station)….a group of ladies I work approached me and gave me a card and a gift. The gift was a charm — I’ve attached a picture of it below. 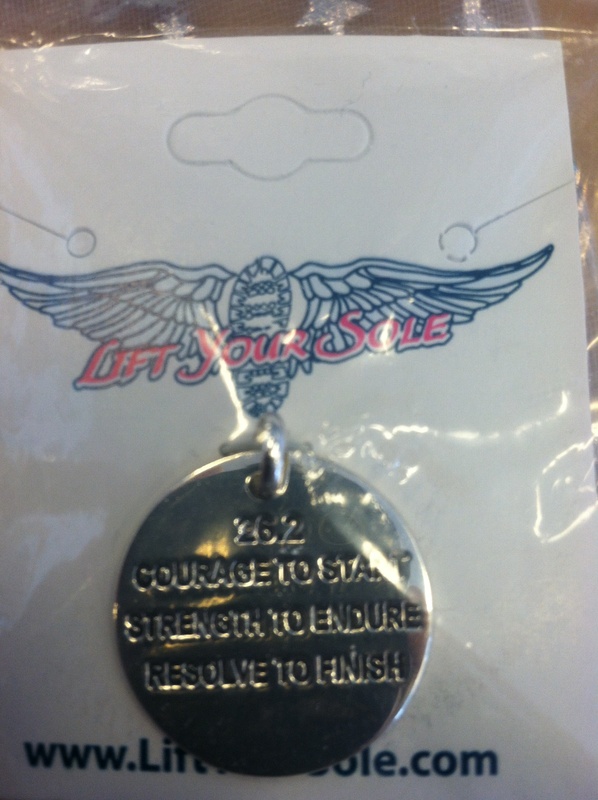 It’s a pretty little sterling silver circular charm that reads “26.2. Courage to Start, Strength to Endure, Resolve to Finish”. The card was simple floral design on the front. But what was inside was the magical part. The card was filled with signatures and words of encouragement of people who Believe In Me, and my Marathon Journey!! I was overwhelmed by their good thoughts and warm wishes for me. It couldn’t have come at a better time, because I’ve been working hard to get myself in a strong, ATHLETE-minded place. I looked at that charm alot that day. Courage to Start. Yeah. Courage was the right word. I remember the day I clicked the SUBMIT button on the Active.com website. With one little click — I was running a marathon. With one little click — I was up for the challenge of my life, to date. It took a LOT a LOT a LOT of courage to click that one little click. It’s funny how much courage is behind some of the smallest things. Courage. Yeah — I have that. I’m bountiful in the Courage department. Strength to Endure. I think I proved to myself that I can rise to this challenge during my Half Marathon Journey. It was wonderful to learn, with every daily run, that my mind, body and spirit would, no…COULD rise to the challenge. STRONG is how I felt when I finished the Half. I felt like an Amazon Woman. There was nothing I could not do. D@mn, that feeling was, no…IS more addicting than cupcakes. Remember that Diane. I think you forget that sometimes, and you shouldn’t. When you start to get fearful, and you crack the door open enough where DOUBT starts to peek through…remember how STRONG you are. You may not have the Strength you need to Endure 26.2 miles today……but you KNOW you can build it. Every day. A little at a time. Strength builds. And You, Girl, are a Builder!! The Half taught you that. Never forget. Resolve to Finish. Hmmm. This is the one. The one that you allow yourself to be wishy-washy about. In little ways, you give yourself an “out clause”. Oh…cut the crap…YOU know the “out clause”. When you tell people that you are running the Disney Marathon….then you toss in the words…”well, I’ll give it a try”, or “If I’m not ready, then I’ll try again next year”, or “well…I can walk it if I have to”. Yeah….the “out-clause”. This is YOU giving Yourself Permission to Fail. You Gotta Stop It. Shut it Down. No More. You need Resolve to Finish. You need the singular Minded Attitude that this Race…this Marathon Race is going to end one way, and one way only. With You, Diane — Runner and baby-gazelle — Running Across The Finish Line — Arms Raised to the Sky — Smile Permanently Planted on your Face (for weeks!! ), and very likely Tears of Joy Streaming Down Your Face! That, sweetheart, is Resolve to Finish! People are lovely. They give their support and encouragement to me so freely. It’s overwhelming sometimes. I mean, it’s easy for this whole experience to occupy my attention. Eating, training, planning, envisioning, building resolve — it’s something I do every day, for a few minutes. It’s ever-present for me. I’m on the journey of my life, after all. The Journey of Becoming the Person I Am Going to Be for the Rest of My Life. God, I get all choked up just typing those words. It’s Huge. It’s SOOOO much bigger than losing weight, or running 26.2 miles. I’m full of gratitude this week. Gratitude toward all of the people who take time out of their busy lives, to think of me, and to feed me spoonfuls of encouragement. I’m grateful that they can “see” what lies at the end of my journey, and just how momentous a change it all brings to my life. My Weight Watcher leader Denise once said to us — her WW underlings — something that I have never forgotten. She knows, better than we, that sometimes we get lost in ourselves on the road to where we want to go. We lose sight of the goal. We get lost along our way, for whatever reason, for however long. For some time….we stop Believing. We lose our Resolve to Endure. What Denise said, was something like this: “We will believe in You……..until You are able to believe in Yourself.” The power of friends is priceless. I put this charm on my chain, along with the pendant that Peter gave me years ago for Valentine’s Day. That pendant is special to me, because it represents Peter, Caitlin and Erin — the 3 most precious people in my life. As I closed the clasp on the chain — I felt something growing. I think it’s my Resolve to Finish. Keep it coming baby. A little bit every day. I’m a Builder, after all!